Taxes are the first things that you shoud set up when creating your Checkout store. That way, as you create new products, you can automatically have the appropriate taxes assigned to them. Unless you have a specific reason to do so you should NOT setup any Tax Regions. Once created Tax Regions cannot be removed and should only be used if necessary. Single tax rates are the most common tax rates and the simplest ones to set up. You would set up a Single-rate Sales Tax if you only needed to charge a state sales tax. You can use the above single-rate steps to create several tax groups that can be applied to various Products (different Tax Group of rates for different products). On invoices, products will be taxed at the Tax Group rate, while the Tax report will show the sales tax collected for the tax authority. You can use the above steps to create several tax groups that can be applied to various Products (different Tax Group of rates for different products). On invoices, products will be taxed at the Tax Group rate, which will be the sum of all the rates associated with the Group. The Tax report will show the sales tax collected for each tax authority (each rate), while the invoice will show the total sales tax collected. To edit a tax code, simply click on an existing entry in the list. 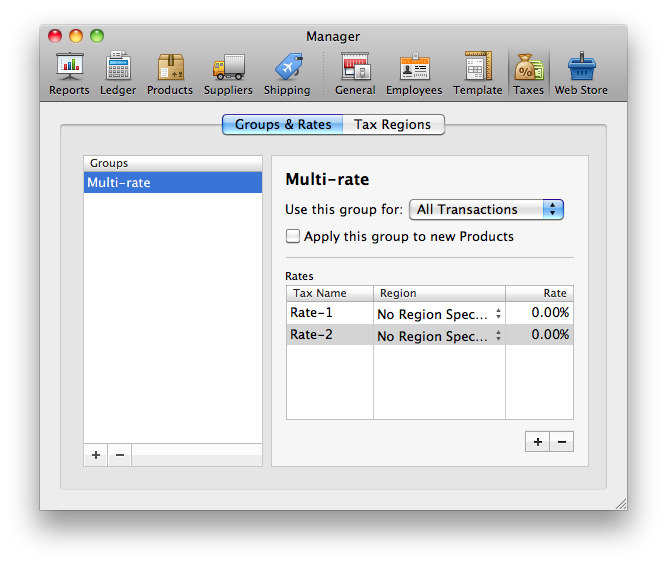 From here, you can assign a new name to a group, and change the name or rate of a tax rate. If you change a existing tax code to be a default or remove it from being a default, previously created Products will not be modified. If you change a tax's percentage, any saved Orders will be updated. 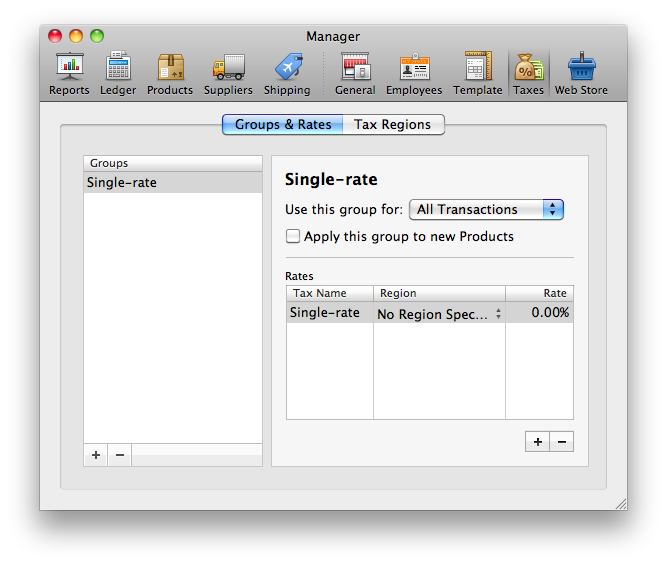 Should you ever need to delete a tax group or code, open the Manager Window and select the Taxes option from there. Select the code you wish to delete by clicking on it to highlight it, and then, in the bottom-left corner of its panel, click on the minus (-) sign. This will remove the tax from your list. Any orders that are in the system will be updated to reflect the deletion of the tax code. Invoices, however, remain unchanged.